Am I on the right path or not? Human beings have the ability to communicate their feelings and thoughts to others through speech. But some thoughts which are too esoteric to be spoken are communicated only through silence. Through these various expressions — feelings, thoughts, speech and silence — we learn about something extraordinary within us, that which makes us feel good when we hear about it, meditate on it and experience it. What is it? What is this truth that lies within us? The answers to these questions will lead you to a state of pure consciousness, the existential experience of being — the source of silence. Is it really necessary to make so much effort, put the body through so much pain? Isn’t there someone somewhere who can answer all my questions? Something is wrong in all this, somewhere there is a missing link. The primary aim of man is to attain and be established in this state and then share his experience with others. Only those answers which serve this purpose are of any value, no matter how many times they are heard or read. The purpose of the question-and-answer is not to impart intellectual knowledge, but to help you access the Self, the existential experience, which Sirshree refers to in almost every answer. Answers to all questions are available at the very place from where the questions originate. When this secret unfolds, you will be able to get to the core, the source or the centre of your being. Then you will say to yourself, ‘No question has remained a question anymore. I can now get all the answers from within myself.’ Hence, you access tejgyan. Tejgyan is that wisdom which is beyond knowledge and ignorance — the source of all knowledge. Knowing and understanding tejgyan leads to a perfectly integrated life. Tejgyan is that state of wisdom where nothing is concealed, everything can be seen clearly. People assume that Meera sang the praises of the Lord and attained wisdom. But it was the attainment of wisdom that made her sing with so much devotion. Jesus attained a particular wisdom and acts of kindness automatically followed. Not the other way around. This ‘particular wisdom’ is tejgyan. The answer to all these doubts and questions is tejgyan — the truth that is beyond knowledge and ignorance, the truth that can only be experienced. And the missing link is that of ‘understanding’. Understanding leads you to the final truth. It is this understanding that Sirshree imparts in the MA Retreat (Maha Aasmani / Magic of Awakening Retreat) organized by Tej Gyan Foundation. This understanding leads you to the experience of truth — you may call it self-realization or enlightenment or God-realization or by whatever name. The direct experience of God or Self is possible provided the right method is followed. Tejgyan is that method, that understanding. That understanding can be attained just by listening — systematic listening. This systematic listening curriculum is called ‘System for Wisdom’. Seeker: How should one watch the thoughts of the mind? Sirshree: The thoughts of the mind are watched by being a witness. If someone asks you how you hear sounds, what will you say? You will not be able to answer it in words as this is something that has to be experienced, not something that can be explained. In the same manner, you cannot see the thoughts of the mind, you can only experience them. Understand this through an example. You sometimes close your eyes and sit, and the tune of a song plays inside your mind. But do your ears hear it? You will say that the internal tune is not heard by the external ears; it is playing inside. But how do you hear a tune that goes inside? Many a time, you begin to hear songs that you do not even remember. How amazing is this! When thoughts go on, they are known by you. In exactly the same way, when thoughts go on, they are known by you. This is because there is awareness in you, which is also called consciousness or the self. Everything is manifesting within this consciousness alone. Like a firecracker in the sky, a thought rises, spreads and vanishes. Then the next thought, and so on. If you understand this secret, you will enjoy every thought like a firecracker. How thoughts are watched is something that is to be experienced. That consciousness, awareness, the self is present all the time. It is continuously awake and knowing even in deep sleep. When there is nothing, then too it is knowing the nothingness. It is because of this that you wake up in the morning and remark, ‘I had a good sleep last night.’ Who examined this good sleep? You came to know of it because the knower of the sleep is present within you. The body and the mind disappears during deep sleep. You are the knower, not the body. The more you are convinced of this, the more will you begin to get established in the consciousness. Seeker: How does one make the mind thoughtless? Sirshree: Mind means a bundle of thoughts. Thoughtlessness means a ‘no mind’ state. To quieten the mind, self inquiry is the most beautiful method. This method is the path (means) as well as the destination (end). When you ask, ‘Who am I?’, then this thought in the form of a question, will cut off other thoughts and end all other thoughts. While this inquiry is on, other thoughts cannot remain. After ending all other thoughts, this last thought of ‘Who am I?’ will also end itself. Then self-realization takes place. This will break the false belief regarding form, the belief regarding the body. You are not limited to the body. You are boundless and limitless. You will realize this through experience. That is why self inquiry is the most beautiful of methods to make the mind thoughtless. Can we know our inner secrets with meditation? Why do questions arise in man? Seeker: Why do questions arise in man? Are all questions important for my spiritual progress? 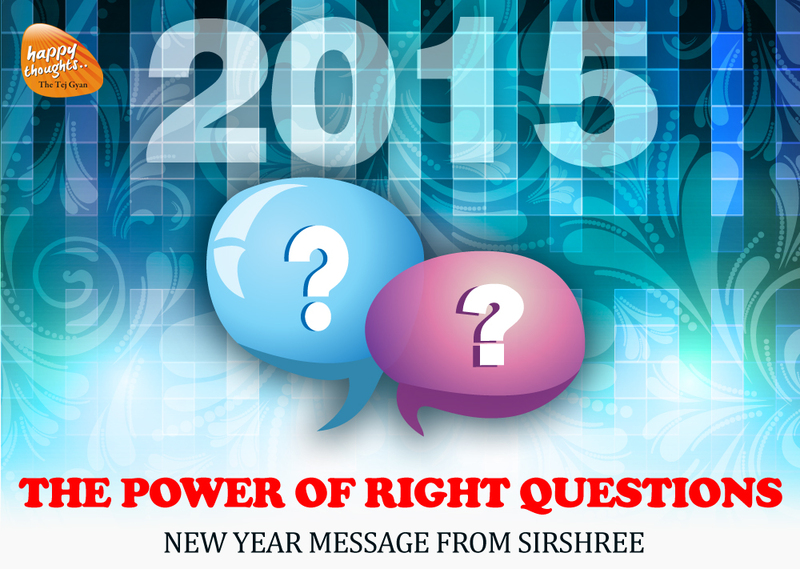 Sirshree: Why do questions arise in man? If that’s your question, the answer is: Why should questions not arise in man? What would happen if man did not have questions and what happens when questions do arise? The right answers encourage the spirit of inquiry and lead to the death of ignorance. When questions arise in man, he begins to search for the answers and evolves in the process. People ask various kinds of questions. Some are for self-development, some are for the purpose of accumulating information, while others are for achieving spiritual progress or awakening. Life wants its secrets to be unravelled; that is its desire, but some effort must be made to understand the mystery. This is similar to the mastermind who creates riddles, but does not want that them to be solved quickly and easily. Hence, the secrets of life are uncovered only by some great souls who make the effort. This is how the game of life is played. It’s an invisible game. Spiritual progress is also not visible to the eye, but the understanding gained by asking right questions and getting the answers helps us to move ahead on the path of spiritual progress. It was only by questioning that the Buddha became the enlightened one. The questions that the Buddha asked on seeing an old man, a sick person and a funeral, initiated the search of that which is immortal and led him to the ultimate truth. When such questions arise in one’s mind, one sets off on the journey to find the truth. With some individuals, such questions lead to scientific discoveries. However, discovery is actually rediscovery. Things that are hidden only need to be rediscovered. Hence, it is important to question. Seeker: How to know which questions are right? Sirshree: Some people want to endlessly ask questions to fatten their books, i.e. they want to gather all the information in the world. Their questions seem endless: What is the price of things in various cities? What is more in demand in which city? Which TV serial has more TRP? What is the speciality of a particular country? What kind of roads do they have? Why are our roads not like theirs? How are festivals celebrated there? What kind of names do they have? How do they pray?… But such questions that are asked only to get information are futile. Questions that are asked to boost one’s ego are totally wrong. It is wrong to ask questions in order to demean the other person (‘Do you know what I know?’) Ask yourself the purpose of asking the question. Is it for displaying your knowledge, for boosting your ego, or for learning the secrets of life and the right way to live your life? Every question reveals the level of evolution of the questioner. When you ask questions, new options open up before you. The only worthwhile questions are those which lead to the end of ignorance and give birth to the spirit of enquiry. When ignorance is eliminated, creation takes place and the highest possibility of creation manifests. This possibility is known as the seventh or supreme level of consciousness. – What are our questions? – What is our present level of consciousness? – How much have we progressed? – How much has our intellect evolved? The answers to these questions open new vistas for you – you are able to think in new ways. As a result, new thoughts, new feelings and new words emerge from you. Your questions reveal your current state. What if, there existed an invisible ladder from 1 to 99? Seeker: Is there any solution for an individual who experiences negative feelings and sees life as one of struggle? Sirshree: Do you have negative feelings about life, about your spouse, about your relations, about your work, about your health? Then you have not discovered the Invisible Ladder. Seeker: What is this Invisible Ladder? Sirshree: Assuming life to be a game of snakes and ladders, everyone believes there are a lot of ups and downs in the journey from 1 to 100. But what if there existed an invisible ladder from 1 to 99? Negative feelings, thoughts, words and incidents are snakes. The positives are ladders. When you are fully grounded in the dual poles of confidence and faith, then you have discovered the invisible ladder that helps you move directly from 1 to 99. When the feeling of Complete Confidence always resides in your heart and when Faith in the Supreme is fully released, then you have climbed the rungs of the invisible ladder. Then you are at 99—from where you have a helicopter view of the life and from where you enjoy the game immensely. Imagine the feeling at 99; whatever dice you roll—you know you shall reach 100. Faith and confidence are not released fully even in the most successful of individuals. And therefore one experiences negative feelings and sees life as one of struggle. Such individuals have to improve their confidence about themselves and release their faith about life. Seeker: If God knows everything, then why should we pray? Sirshree: There are many who feel – If God knows everything, then why should we pray? They are told: It is because God knows everything that He is making you pray. He is making you pray so as to create a receptive state in you, by which your wish can come to you and be fulfilled. As soon as your state changes, everything around you also changes. Prayer changes you. It creates that receptivity in you by which the thing you want – be it an object, information or an answer – is attracted towards you. Therefore, prayer is not a question, it is an answer.